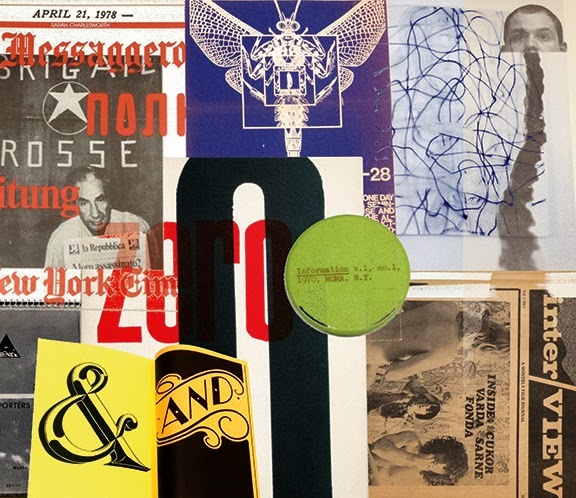 Our October catalog is a selection of recent arrivals including books, posters, multiples and ephemera by Tauba Auerbach, Stanley Brouwn, Lee Bontecou, Sarah Charlesworth, Mike Kelley, Yayoi Kusama, Piero Manzoni, Brice Marden, Christopher Wool, and the Zero Group, not to mention a collection of early Inter/View magazines, and a christmas gift sent out by Factory Records in 1979. For additional images (at higher resolution) see the Flickr Set devoted to this listing. A few copies of 6 Decades' newest publication Various Small Flyers are still available for purchase at $25 per copy. Please email with queries or to place an order.